Step 1: To remove prints off the bed, work the edge of the tool under a corner of the print, approximately half way between the tip of the blade and the handle. Step 2: Use a sawing motion to get the tool under the rest of the print to separate it from the bed. Tilting or twisting the blade slightly will help speed up the lifting of the print. Step 3: If the print is firmly stuck to the print bed, try pushing the tool so that the handle is closer to the print. This brings the thicker part of the blade (closest to the handle) under the object and acts as a wedge to help pry the part up. Wiggle the blade loose and repeat. Step 4:If the print is stuck too firmly to remove with the tool, you may need to slightly increase your starting nozzle elevation. The idea is to have the print stick firmly to the bed during printing, but still be removed with the tool. Step 5: If the nozzles blocked, check the size of output diameter and choose the correct needle. Then, clean the nozzles by cleaning needles and tweezers. VARIOUS SIZE – 10 pieces cleaning needles in 2 different size 0.3 mm, 0.4 mm, suitable for cleaning most of your 3D Printer nozzles. 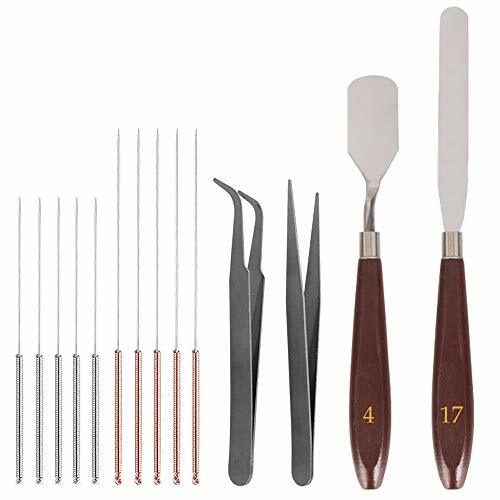 PREMIUM QUALITY- Both needles and tweezers are made of high quality stainless steel, flexible, sturdy and durable. The palette knife have a plastic handle and a sharp & hardened blade. STYLISH AND USEFUL- The spatulas have a brown ergonomic plastic comfort grip, one of them has a short beveled front edge, another one has a flat long front edge. WIDE COMPATIBLE- Compatible with most of 3D printers extruder nozzles, such as E3D Makerbot, MK8 Makerbot RepRap and so on. 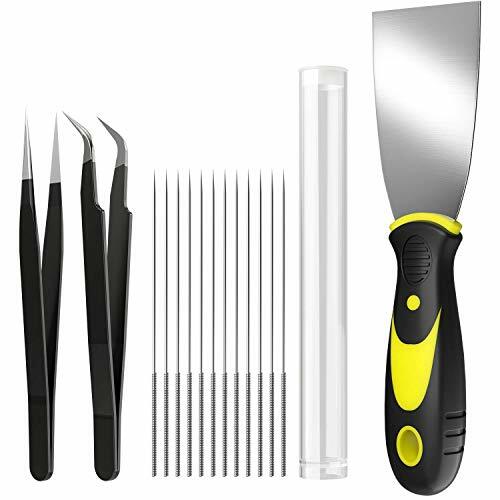 VALUE PACKAGE- The package includes: 2 x Palette Knife, 10 x Needles (5x 0.4mm, 5x 0.3mm) and 2 x Tweezers. 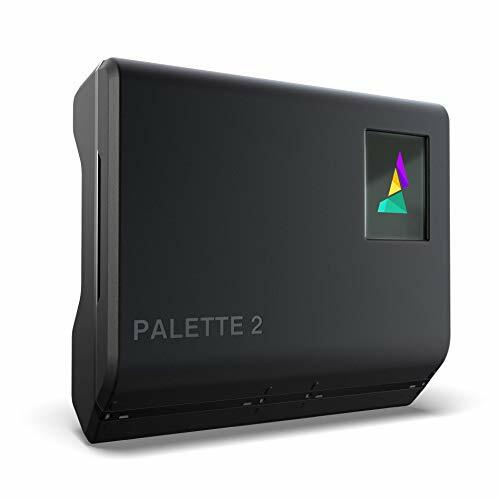 Compatible with large majority of 1.75 printers: Raise3D N-Series, MakerGear, Robo, gCreate, CR-10, Original Prusa, Printrbot, SeeMeCNC, Wanhao i-Series, TEVO, Anet, BEEVERYCREATIVE, RepRap, and more!